Trade and Pacific security will be on the agenda when U.S. President Barack Obama meets next week in California with leaders of 10-member states of ASEAN, the Association of Southeast Asian Nations. The leaders meet Monday and Tuesday (Feb. 15-16) at the Sunnylands estate in Southern California, where Obama met with Chinese leader Xi Jinping in 2013. Trade and Pacific security will be on the agenda when U.S. President Barack Obama meets next week in California with leaders of the 10 member states of ASEAN, the Association of Southeast Asian Nations. 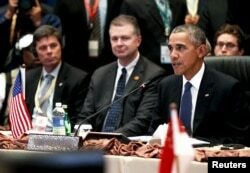 U.S. officials say the meeting is part of an American rebalancing to the Asia-Pacific region. China, which is not an ASEAN member, is the number one U.S. trading partner. The ASEAN nations together rank number four. At the side-by-side ports of Los Angeles and Long Beach in California, trade with Southeast Asia is booming, totaling over $53 billion in 2014 and making the ASEAN nations the second-largest trading partner for Los Angeles. "We have a Thai Town here," said Stephen Cheung, president of World Trade Center Los Angeles, which works to attract international trade and foreign investment to the region. Southern California is home to immigrant populations from every part of Southeast Asia, and has the largest Vietnamese community outside of Vietnam and largest Philippine community outside the Philippines. "These are all assets that we leverage," Cheung said. Many American companies do business with Vietnam, from established brands like Starbucks and Pizza Hut to Silicon Valley tech startups. They are attracted by high growth in the region. Vietnam's economy is expanding at more than 6 percent a year. The Philippines sees similar growth rates and seeks investment in agricultural products such as cacao and coffee, and in manufacturing, medical tourism, and other sectors. FILE - U.S. President Barack Obama, right, delivers remarks at the US-ASEAN meeting at the ASEAN Summit in Kuala Lumpur, Malaysia, Nov. 21, 2015. "You can service the various countries in Southeast Asia from the Philippines," said Gerry Palon of the Federation of Philippine American Chambers of Commerce. "We [the Philippines] are the gateway also to the Pacific, reaching out to Hawaii and on the mainland USA via the Pacific Ocean," he said. The United States and China are both working to boost trade ties with Southeast Asia, whose 625 million people share an economy of more than $2 trillion. A free trade agreement among the 10 ASEAN nations, known as the ASEAN Economic Community, went into effect late last year. The U.S. is the driving force behind the 12-nation Trans-Pacific Partnership, which was signed this month in New Zealand. Four members of ASEAN — Brunei, Malaysia, Singapore and Vietnam — have joined the TPP. All 10 ASEAN member states are also set to join a proposed Pacific trade group spearheaded by China, the Regional Comprehensive Economic Partnership. The meeting in California is expected to draw protests. International human rights groups have criticized Cambodia in particular and its longtime prime minister, Hun Sen, for what the critics call repression and human rights abuses. Human Rights Watch says most other ASEAN members also have "poor human rights records." 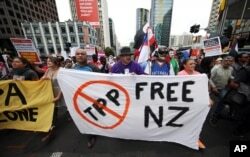 FILE - Protesters march to the venue of the Trans-Pacific Partnership signing in Auckland, New Zealand, Feb 4, 2016. Opponents of the U.S.-led Trans-Pacific Partnership have also promised to hold protests over the trade agreement. White House aides have said Obama will address security issues when he meets with ASEAN leaders, including North Korea's nuclear test last month and missile launch Sunday. Obama is also expected to tell the visiting leaders that rival claims by China and other Asian nations in the South China Sea should be resolved through negotiation and not, as one U.S. official said, "through one bigger nation bullying a smaller one." China has engaged in building artificial islands in the busy shipping region, which U.S. officials say could have military uses.